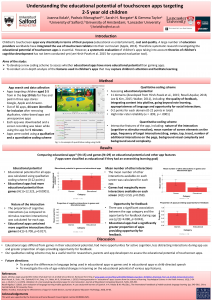 We are working on an ESRC funded project titled "Investigating the educational potential of touchscreen apps for children's early vocabulary acquisition" in collaboration with Professor Padraic Monaghan at the University of Lancaster. The aim of this project is to investigate children's language learning apps to develop a scientific understanding of the app marketplace and to apply developmental theories of learning, memory and language acquisition to the development of educational touchscreen apps. The proposed project will combine a systematic review of the children's educational app marketplace with a series of studies to explore how children aged 2-4 years learn language from touchscreen apps and digital media. We are interested in understanding the role that digitally mediated interactions can have on 3-4 year old children's emotion understanding and emotional development. When learning from digital media, children up to the age of 3 years often struggle to transfer information learnt in a digital context to the real worldand vice versa. We are interested in investigating how 2-3 year old children learn from digital media. If you are a parent or early years teacher or head teacher and would like your child or nursery to get involved in one of our exciting projects, please contact us we'd love to hear from you!